Love of clean lines in their genes and both adhered to identical principles. Such as furniture should not stand in the way of space in a room. Obviously and understandably the younger of Rietveld’s sons found great inspiration in the creations of his father. Check out a nice sample of Wim Rietveld works at Modernfindings and also Amsterdam Modern, which inspired this post. And don’t miss this feature on Gerrit Rietveld produced by PHAIDON with an interview of Ida van Zijl the curator of the Rietveld’s Universe exhibition. “In 1925 modern tubular furniture was born. Its birthplace was the Bauhaus, famed German school of architecture and design which Nazis later turned into a domestic science school for girls. It had a bony infancy. Fad-hungry interior decorators pounced on its chromium steel chairs and glass-topped tables. But many a buyer found it short on fun, however long on function. Trouble was – and still is – that metal furniture was cold in surface and line, clammy or hot according to the weather. Meanwhile, in Finland, a brilliant young architect named Alvar Aalto and his architect wife, Aino, really got somewhere with modern furniture. Influenced by the Bauhaus and Le Corbusier (real name: Charles-Edouard Jeanneret), but experimenting in plywood instead of steel, they smoothed out geometric kinks, turned out chairs which combined the functional with good sense and charm. 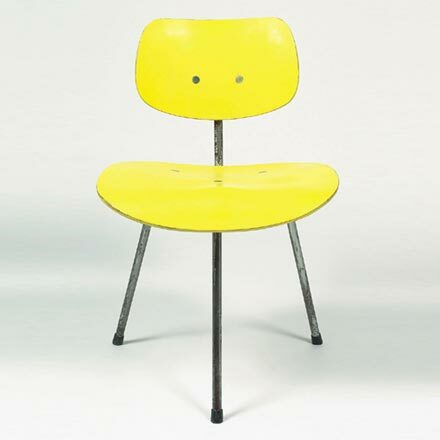 The Aaltos were the first to make chairs with pliant one-piece backs and resilient seats. They pioneered also in welding together layers of plywood with synthetic cement, cold-pressing them for six weeks into posture-pleasing shapes. Last week Alvar and Aino Aalto opened their own furniture store (Artek-Pascoe, Inc.) in Manhattan. The Aaltos’ plywood sandwiches of maple and birch are shaped in Wisconsin, shipped East for assembly. Colors of the finished pieces of furniture – many of them Aalto-patented – ranged from natural finish through cellulosed red and blue to black. On display also went Aalto-designed screens and glassware. Aalto felt that steel tubing was unsuited to living spaces and he disliked its tinny sound. He took advantage of the elasticity of birch wood, whose spring qualities had hitherto only been only used for skis. Around the same time different solutions were followed by other designers, most notably Heinz and Bodo Rasch’s “Sitzengeiststuhl” (“the spirit of the sitting chair”) and Gerrit Rietveld. The radical innovation of Rietveld’s design was that it did not follow the imaginary lines of a cube, but instead a diagonal. 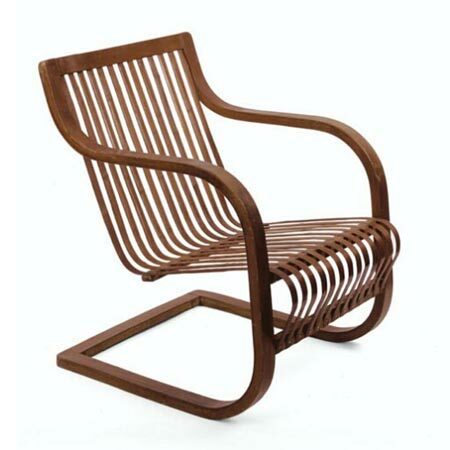 This one was designed while Perriand was in Japan and made out of plywood and bamboo elastic bands. This armchair, an interpretation of Alvar Aalto’s designs (Model No. 31 in particular), was made for her exhibitions at the Takashimaya department stores in Tokyo and Osaka in 1941. The exhibition Tradition, Selection, Creation was opened under sponsorship of the Chamber of Commerce and Industry and the French Embassy. It can be considered the immediate outcome of Perriand’s official appointment as advisor to Japanese industrial art production from 1940 to 1941 and her collaboration with Junzo Sakakura. More from the Philips, de Pury & Company catalog description here. Manufacturing a chair out of a single plywood sheet had been achieved long before Panton’s design by Gerald Summer and Hans Pieck, but it is only with Panton that a cantilever design was made possible. Hugo Häring had proposed in 1949 a prototype made out of a single sheet of metal; the model was intended for production in plywood but never came to be. 1. George Nelson: Architect, Writer, Designer, Teacher just opened at the Oklahoma City Museum of Arts until April 11th. 3. A quick guide to collecting mid-century furniture courtesy Brooklyn Based. Only a couple of weeks left to visit the exhibition at the Centraal Museum Utrecht (via the always informative Abitare). We will not make it, but there is the catalog to console oneself.